Merrill Mahaffey was commissioned this summer to do a 14 foot long painting for the City of Scottsdale's Public Library. 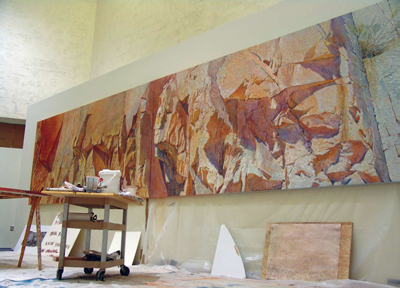 Merrill Mahaffey has made a living painting various incarnations of the rock forms found around his home in Phoenix, Arizona. His newest work, however, takes the idea of incarnations to a whole other level. The painting, titled Emergence, shows the face that Mahaffey is talking about. To him, the face looks like a Persian soldier at the time of their battles with the Greeks and it has since inspired several more paintings by Mahaffey. 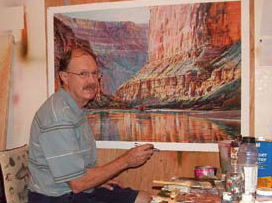 Merrill Mahaffey in his studio. This experience led Mahaffey to start looking for other rock formations around Arizona that have anthropomorphic qualities. Other formations have recently attracted his attention as well. Much of Mahaffey’s thinking about these subjects began during his childhood in Colorado. 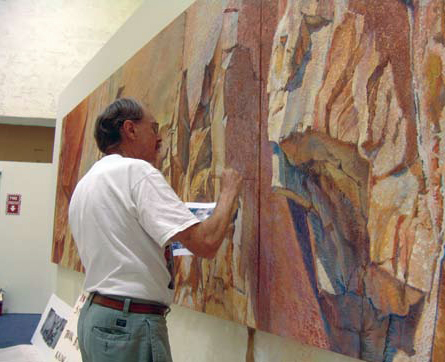 Mahaffey has been painting rock formations, in both a realist and abstract style, for his entire life. While his earlier work was more abstract versions of the landscape, he turned to more realistic interpretations of these places later in his career. Now, at 70, he finds himself turning towards abstraction again. The work, titled Cochise Fracture Signatures, is in the style of his more abstract paintings focusing on strata in rock formations. Just as rocks are the basis for the geography, they will always be the most important aspect of Mahaffey’s work, whether in the realist or abstract style. 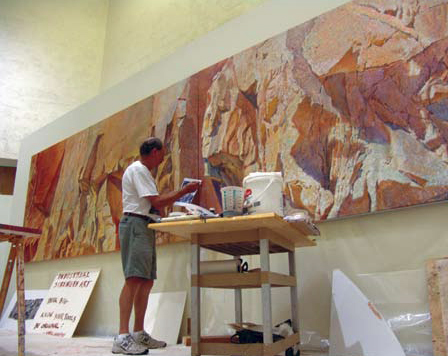 Earlier this summer, Western Art Collector was invited to visit Merrill as he painted a new 14 foot mural for the Scottsdale Public Library. The work, titled Cochise Fracture Signatures is another abstracted look at canyon walls and the rock formations and fractured lines made by nature.